I’m pleased to announce that I’ve finally figured out the subject of my next book, which will be a biography of the architect and futurist Buckminster Fuller. If you’re a regular reader of this blog, you probably know how much Fuller means to me, and I’m looking forward to giving him the comprehensive portrait that he deserves. (Honestly, that’s putting it mildly. I’ve known for over a week that I’ll have a chance to tackle this project, and I still can’t quite believe that it’s really happening. And I’m especially happy that my current publisher has agreed to give me a shot at it.) At first glance, this might seem like a departure from my previous work, but it presents an opportunity to explore some of the same themes from a different angle, and to explore how they might play out in the real world. The timelines of the two projects largely coincide, with a group of subjects who were affected by the Great Depression, World War II, the Cold War, and the social upheavals of the sixties. All of them had highly personal notions about the fate of America, and Fuller used physical artifacts much as Campbell, Asimov, and Heinlein employed science fiction—to prepare their readers for survival in an era of perpetual change. Fuller’s wife, Anne, played an unsung role in his career that recalls many of the women in Astounding. Like Campbell, he approached psychology as a category of physics, and he hoped to turn the prediction of future trends into a science in itself. His skepticism of governments led him to conclude that society should be changed through design, not political institutions, and like many science fiction writers, he acted as if all disciplines could be reduced to subsets of engineering. And for most of his life, he insisted that complicated social problems could be solved through technology. During his lifetime, Fuller was one of the most famous men in America, and he managed to become an idol to both the establishment and the counterculture. In the three decades since his death, his reputation has faded, but his legacy is visible everywhere. The influence of his geodesic structures can be seen in the Houston Astrodome, at Epcot Center, on thousands of playgrounds, in the dome tents favored by backpackers, and in the emergency shelters used after Hurricane Katrina. Fuller had a lasting impact on environmentalism and design, and his interest in unconventional forms of architecture laid the foundation for the alternative housing movement. His homegrown system of geometry led to insights into the biological structure of viruses and the logic of communications networks, and after he died, he was honored by the discoverers of a revolutionary form of carbon that resembled a geodesic sphere, which became known as fullerene, or the buckyball. And I’m particularly intrigued by his parallels to the later generation of startup founders. During the seventies, he was a hero to the likes of Steve Wozniak and Steve Jobs, who later featured him prominently in the first “Think Different” commercial, and he was the prototype of the Silicon Valley types who followed. He was a Harvard dropout who had been passed over by the college’s exclusive social clubs, and despite his lack of formal training, he turned himself into an entrepreneur who believed in changing society through innovative products and environmental design. Fuller wore the same outfit to all his public appearances, and his personal habits amounted to an early form of biohacking. (Fuller slept each day for just a few hours, taking a nap whenever he felt tired, and survived mostly on steak and tea.) His closest equivalent today may well be Elon Musk, which tells us a lot about both men. And this project is personally significant to me. I first encountered Fuller through The Whole Earth Catalog, which opened its first edition with two pages dedicated to his work, preceded by a statement from editor Stewart Brand: “The insights of Buckminster Fuller initiated this catalog.” I was three years old when he died, and I grew up in the shadow of his influence in the Bay Area. The week before my freshman year in high school, I bought a used copy of his book Critical Path, and I tried unsuccessfully to plow through Synergetics. (At the time, this all felt kind of normal, and it’s only when I look back that it seems strange—which tells you a lot about me, too.) Above all else, I was drawn to his reputation as the ultimate generalist, which reflected my idea of what my life should be, and I’m hugely excited by the prospect of returning to him now. Fuller has been the subject of countless other works, but never a truly authoritative biography, which is a project that meets both Susan Sontag’s admonition that a writer should try to be useful and the test that I stole from Lin-Manuel Miranda: “What’s the thing that’s not in the world that should be in the world?” Best of all, the process looks to be tremendously interesting for its own sake—I think it’s going to rewire my brain. It also requires an unbelievable amount of research. To apply the same balanced, fully sourced, narrative approach to his life that I tried to take for Campbell, I’ll need to work through all of Fuller’s published work, a mountain of primary sources, and what might literally be the largest single archive for any private individual in history. I know from experience that I can’t do it alone, and I’m looking forward to seeking help from the same kind of brain trust that I was lucky to have for Astounding. Those of you who have stuck with this blog should be prepared to hear a lot more about Fuller over the next three years, but I wouldn’t be doing this at all if I didn’t think that you might find it interesting. And who knows? He might change your life, too. Typewritten manuscripts, which take up more pages than printed texts, deceive the author by creating an illusion of great distance between things that are so close to one another that they repeat themselves crassly; they tend in general to shift the proportions in favor of the author’s comfort. For a writer capable of self-reflection, print becomes a critique of his writing: it creates a path from the external to the internal. For this reason publishers should be advised to be tolerant of authors’ corrections. I’ve been thinking about a book on John W. Campbell, Jr., the pulp author and editor who ran Astounding Science Fiction, later known as Analog, for more than three decades. Campbell’s fingerprints are on everything from I, Robot to Dune to Star Trek—Isaac Asimov called him “the most powerful force in science fiction ever”—and his influence on global culture is incalculable. Late in his life, he became increasingly erratic and conservative, embraced a range of crackpot theories, and played an important role in the early history of dianetics and Scientology. There’s a tremendous amount of fascinating material available in his published letters, in his editorials, in his own fiction—he wrote the original story that became the basis for The Thing—and in the reminiscences of nearly every major science fiction writer from the first half of this century. Yet there’s never been a proper biography of Campbell or consideration of his legacy. And I’m starting to think that I might just be the guy to write it. 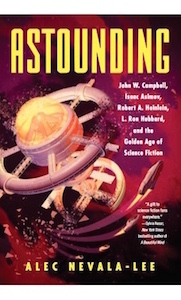 That was the beginning of the long road that led to Astounding: John W. Campbell, Isaac Asimov, Robert A. Heinlein, L. Ron Hubbard, and the Golden Age of Science Fiction, which is finally being released today. But there were times when I feared that it would never get past the daydream stage. Based on the ensuing email exchange, it sounds like my agent and I spoke about it over the phone that afternoon, and while I don’t recall much about our discussion, I remember that he was encouraging, although he sounded a few cautionary notes. Writing a big mainstream biography would mean a considerable shift in my career trajectory—up until that point, I had only published novels, short fiction, and essays—and it would take a lot of convincing to persuade a publisher that I was ready to take on this kind of project. At first, all of my energy was devoted to putting together a convincing proposal, which took about four months of work, during which I did much of the preliminary research and went through several rounds of feedback and rewrites. It wound up being about seventy pages long, and it was focused entirely on Campbell. We went out to a handful of publishers toward the end of the following January, and we got indications of interest from two editors. One was Julia Cheiffetz at Dey Street Books, an imprint of HarperCollins, who suggested that we “reframe” the book to bring in a few other famous writers, since Campbell wasn’t as well known in the mainstream. (She pointed specifically to Positively 4th Street: The Lives and Times of Joan Baez, Bob Dylan, Mimi Baez Fariña, and Richard Fariña by David Hajdu as one possible model.) I responded that I could expand the book to include Asimov, Heinlein, and Hubbard, and the notion was agreeable enough that I was able to announce the project on this blog on February 26, 2016. Obviously, a lot has happened since then, both in my life and in everyone else’s. I couldn’t be happier with how the book turned out, but what strikes me the most now about the whole process is one line from that original email: “I’m starting to think that I might just be the guy to write it.” Looking back, I can’t for the life of me recall what inspired me to write that sentence, which in retrospect seems full of unwarranted confidence. About halfway through this book, I realized that there was a good reason why no biography of Campbell had ever been written. It’s just an incredibly complicated project, and working on it for nearly three years to the exclusion of everything else was barely enough to do it justice. When I look at the result, I’m very proud, but I also feel that it could easily have been much longer. (In fact, the first draft was twice as long as what ended up in print, and it wasn’t because I was padding it.) I didn’t have all the critical tools or the background that I needed when I started, and much of my recent life has been devoted to turning myself into the kind of person that it seemed to require. What I had in mind, basically, was a book that looked a certain way. It was sort of like Hajdu’s book, but also like a prestige literary biography along the lines of Adam Begley’s Updike, which is the kind of thing that I personally enjoy reading. This imposed certain expectations when it came to tone, size, and scholarship, and my ultimate goal was to end up something that wouldn’t look out of place on the same shelf—apart, perhaps, from the exploding space station on the cover. Along the way, I did the best impersonation that I could of the kind of person who could write such a book, and toward the end, I like to think that I more or less grew into the role. At every turn, I tried to ask myself: “What would a real biographer do?” And while I’m clearly the last person in the world who can be objective about this, I feel that the finished product reflects those standards. Anyway, it’s out in the world now, and not surprisingly, I’ve been wondering endlessly about how it will be received—although it isn’t all that I have on my mind. This is still a terrible time, and there are moments when I can barely work up enough enthusiasm to care deeply about anything but what I see in the headlines. (When my publisher decided to push the release date back from August to October, part of me found it hard to believe that people would have the bandwidth to read about anything except the midterms, and I don’t think I was entirely wrong.) But I’m going to close this post with a direct appeal, and I promise that it’s the only time that I’ll ever say something like this, at least for this particular book. If you’ve enjoyed this blog or my writing in general, I’d encourage you to consider buying a copy of Astounding. I was lucky to have the chance to work on almost nothing else for the last three years, and I’d very much like to do it again. Whether or not that happens will hinge in large part on how well this book does. The more I think about Astounding, in fact, the more I feel that that it couldn’t have happened in any other way. It needed all the time and commitment that I was able to give it, and it also benefited from being released through a commercial publishing house, which subjected it to important pressures that obliged it to be more focused than it might have been if I had gone through an academic imprint. And it’s the better for it. Very few critical works on science fiction have been produced under such circumstances, but I also suspect, deep down, that this is how a book like this ought to be written. At least it’s the only way that I’ll ever be able to write one. If I’m ever going to do it again, enough people have to agree with me to the extent of paying for a copy. That’s only sales pitch that I have—except to say that if you’ve read this far, you’ll probably enjoy this book. And I’m grateful beyond words that I had the chance to do it even once. Yesterday, I began to hear rumors that something was out in the world. My first clue was a congratulatory note from my agent in New York, who sent me an email with the subject line: “It’s a book!” The message itself was blank, except for a picture of his desk, on which he had propped up the hardcover of Astounding. A few hours later, I saw an editor for a pop culture site post the image of a stack of new books on Twitter, with mine prominently displayed about a third of the way from the bottom. In the meantime, there wasn’t any sign on it on my end—I hadn’t even seen the finished version yet. (I signed off on the last set of proofs months ago, and I’ve spent an inordinate amount of time admiring the cover art, but that isn’t quite the same as holding the real thing in your hands.) When the mail came that afternoon, there was nothing, so I figured that it would take another day or two for any shipment from my publisher’s warehouse to make it out to Chicago. In the evening, I headed out to the city, where I was meeting a few writers for dinner before our event at Volumes Bookcafe. When one of my friends arrived at the restaurant, he announced that he had heard a thud on his doorstep earlier that day, and he proudly pulled out his personal copy of the hardcover, from which he had prudently removed the dust jacket. At this point, I was starting to suspect that everybody in America would get it before I did, and when I arrived at the bookstore, I was genuinely shocked to see a table covered with copies of the book, which doesn’t officially come out until October 23. And although I should have been preparing for my reading, I took a minute to carry one into a quiet corner so that I could study it for myself. Well, it definitely exists, and it’s just as beautiful as I had hoped. As a writer, I don’t have any control over the visual side, but the artist Tavis Coburn and the designers Ploy Siripant and Renata De Oliveira did a fantastic job—I’m obviously biased, but I don’t think any book about science fiction has ever come in a nicer package. The fact that I managed to get the hardcover version out into the world before physical books disappeared entirely is a source of real pride, and I look forward to seeing copies of it in thrift stores and cutout bins for years to come. And while I can’t speak to the contents, at first glance, they seemed perfectly fine, too. After the reading, which went well, I made my first sale of Astounding ever in a bookstore, and as I signed all the remaining copies that the store had on hand, I was sorely tempted to buy one for myself. I sent a picture of the stack on the display table to my wife, who texted back immediately: “Your copies came! One big box and one small one.” An hour or so later, I was back home, where I sliced open the first carton, then the second, to reveal my twenty-five author’s copies. (I’ll keep three for myself and gradually start to send the rest to various deserving recipients.) Now it’s the following morning, and the book is inexorably starting to assume the status of a familiar object. It’s lying at my elbow as I type this, and I can already feel myself taking it for granted. I suppose that was inevitable. But I’ll always treasure the memory of the day in which everyone I knew seemed to have it except for me. I mention all this now because an excerpt of the audiobook version of Astounding has just been posted on SoundCloud. It’s about five minutes long, and it includes the opening section of the first chapter, which recounts a rather strange incident—involving drugs, mirrors, and hypnosis—from the partnership of John W. Campbell and L. Ron Hubbard in the early days of dianetics. The narrator is Sean Runnette, who certainly knows the territory, with previous credits that include Heinlein’s The Number of the Beast and the novel that was the basis for The Meg. He does a great job, and although I haven’t heard the rest, which comes to more than thirteen hours, I suspect that I’m going to end up playing all of it. One of the hardest parts of writing anything is putting enough distance between yourself and your work so that you can review it objectively. For a short story, I’ve found that a few weeks is long enough, but in the case of a novel, it can take months, or even longer. And I’m not remotely close to that point yet with this book. Listening to this audio sample, however, I finally felt as if it had been written by somebody else, as if the translation from one medium into another had yielded the same effect that I normally get from distance in time. (Which may be the real reason why reading your work out loud might be a good idea.) I’m glad that this audio version exists for a lot of reasons, but I’m especially grateful for the new perspective that it offers on this book, which I wrote largely because it was something that I wanted to read. And so far, I actually like it. My feeling is that only the author (and certainly not a computer program) can do this job well. Only the author, looking at a given page, sees all the way to the bottom of the pool of ideas of which the words are the mere surface, and only the author can answer the question, “What am I really talking about here, in this paragraph, this page, this section, this chapter?” To answer those questions takes total understanding of the book. Hofstadter adds that going through the book one last time awakened him to deeper themes and concepts that he hadn’t known were there, including “conflation,” “colliding cultures,” and “Chopin.” He concludes: “Once the index was essentially done…I found it interesting to flip through it and, by comparing the sheer sizes of various entries, to get new perceptions of what my book is most centrally about.” At a point at which a writer might be expected to have looked at a manuscript from every angle, an index can be a fund of new insights. I looked over the index, which had, presumably, been professionally prepared, to see if I could learn lessons in technique. I quickly found that the only lesson I could learn would be on the method of preparing a thoroughly inadequate index. Half the names in the book were not included. A number of subjects were not mentioned. It was dreadful; simply dreadful. It left out a great variety of things that should have been put in. It was the slapdash job of someone working for money instead of for his own book, and never again was I fooled by any talk of expertise in indexing. When I later discovered that I had been charged five hundred dollars against royalties for the privilege of having that rotten index made, I was ready to choke DeHaan.